The roadsides are ablaze with color in my little part of the world. Vibrant, joyful color – hailing summer with fiery orange lips and golden throats. 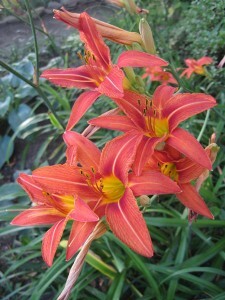 Hemerocallis fulva is in full bloom, though most know her as the tawny daylily, roadside lily and even the outhouse lily. She is common, she is vulgar, she is aggressive and she is cheap, but oh how I love her. I am not supposed to. She is an invasive – an unwanted escapee from colonial gardens and farms so very long ago. In my defense, I have tried to be politically correct upon this issue. I have lowered my eyes and nodded demurely when walks with naturalist friends brought us face to face with vast swaths of woodland claimed by this wanton beauty. 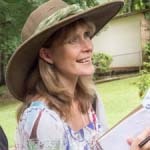 Heated words rang out in the undergrowth and I did not defend her – recognizing that her desire to populate every square inch of claimed and unclaimed land was not particularly ladylike. In fact, she has been so successful in this particular endeavor that many people think of her as the state flower of Maryland, or Delaware, or Virginia, or….well, you get the picture. H. fulva was brought to our shores back in the 17th century by the Europeans, and soon escaped, as all things eventually did, to woodlands and roadsides up and down the East coast and far into the Midwest. Just like the cherry trees that line the Tidal Basin of our nation’s capital, she originally hails from Asia, where petals and sepals are often used medicinally and in the kitchen. I don’t know how well she flavors soup, but she certainly is a miracle worker when it comes to erosion control, which is why she was so popular so long ago. H. fulva is stoloniferous – that is to say, she does her spreading surreptitiously, under cover of about two inches of good (or not so good) soil. 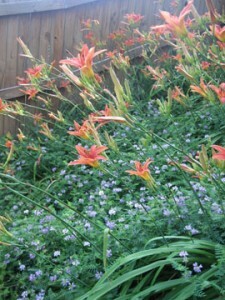 Many cultivated daylilies, in comparison, are clump forming and fairly well-behaved. Stolons are difficult to eradicate completely, but they hold on to dirt like no one’s business – growing in problem areas like drainage ditches and steep hillsides. It is that very growth habit that allows her to outcompete many native species, and to give her due, she does so quite beautifully. However, for this very reason, we must hate her my friends. We must eschew her in favor of something smaller, something less gaudy – something native. Shall we change our minds in five hundred years I wonder, or will she never have a place at the table? Will our descendents never see Mertensia or Claytonia carpeting the woodlands in early spring, but instead marvel at the beauty of a dappled woodland set on fire in early summer? Is that an acceptable trade off? I cannot answer that question; I am a bluebell watcher myself. Whatever you think of her methods, she is a lifesaver in the home garden. Sun or shade, she will sigh and get on with it – bringing a bright spark to my northside garden and covering a difficult hillside above the beehives with raging color. In this spot, Mother Nature has also sown crown vetch, which blooms lavender-white at her feet, and the effect is quite simply charming. 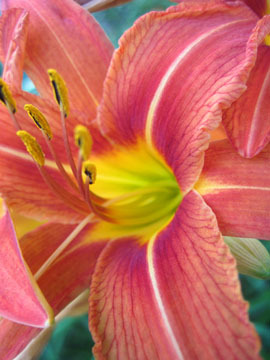 A daylily is so named because of the length of bloom of individual flowers on tall scapes produced anywhere from early summer to early fall. Though the flowers are fated to live only a day, they are rapidly replaced by others on the same scape – making the genus a decent cut flower for the home gardener. 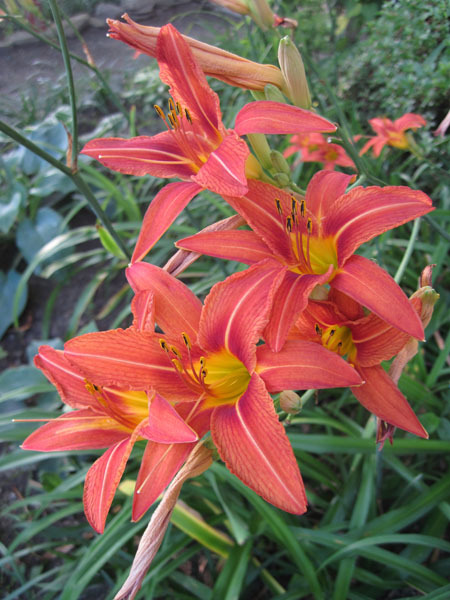 Hemerocallis are so popular, and so varied, that there is a society devoted to nothing else but the propagation and protection of this plant. There are colors ranging from the softest of pinks to blackest of purples, and they bring a welcome spot of color to Mid-Atlantic gardens besieged by the heat and humidity of deepest summer. However ordinary, however aggressive, however controversial, there will always be a soft spot in my heart for this common little contender on the daylily stage. Her presence on the roadsides lifts my spirits when temperatures rise and flowers in my own garden are fading. I cannot turn my head away and pretend that she is not stunning simply because of a line drawn in the sand four hundred years ago. Beauty is beauty, after all. What a shame that our prejudices often prevent us from seeing it. When we first moved to Maryland I brought a daylily dug from our Alexandria home. I tossed it behind the driveway and then in the pressures of everyday life I promptly forgot about it. Three months later I noticed it sitting, bare roots and all, patiently waiting for me to get around to planting it. I did so and it rapidly spread around the hillside. 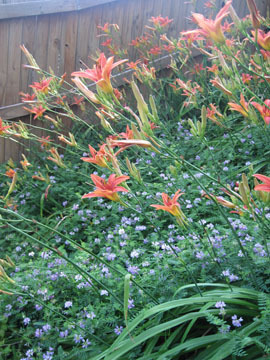 I’ve since gone on to more well-behaved and differently flowered daylilies but I can understand your admiration of the plant in the wild. It is remarkable how outgrows many other species along the roadside to provide that colorful verge. That, and Verbascum thapsus, another favorite of mine. Who needs cultivated mulliens when you can take seeds from some of these candelabra beauties, eh? Betsy,Out day lilies have just steatrd to bloom and bloom they only last a day, but they have many blooms for each day this week. My husband bought 3 very fancy day lilies over 5 years ago and they have never bloomed, this year they are in full flower and are stunning. He was sure that one day they would do more than just put out leaves.We had a huge patch of the lilies in the yard when we moved in 20 years ago the 4th of July we have separated them and planted them in the woods and what a fine show a reward.Foxglove is just 10 foot tall prolific, we never plant it but it is another roadside attraction as are these sweet little daisies that are blooming now too and 3 tall deep blue plants I have never seen before bird gifts I think!Thank you for sharing your garden adventures which are very similar to mine though I never can remember the names of the plants. Darn it all!To summer and flowers beauty and your lovely history/ storytelling adventure here. Thank youPatriciab4s last blog post..